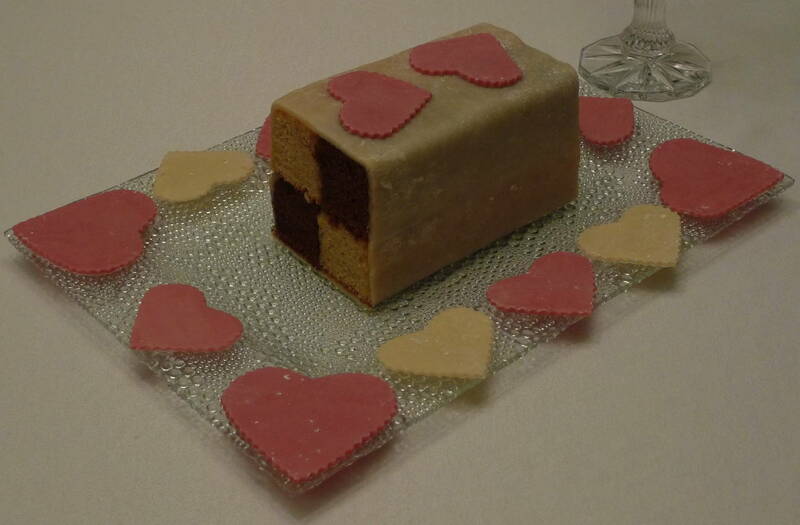 For the grand finale of our Downton Abbey-inspired Valentine dinner, I made a Battenberg cake! 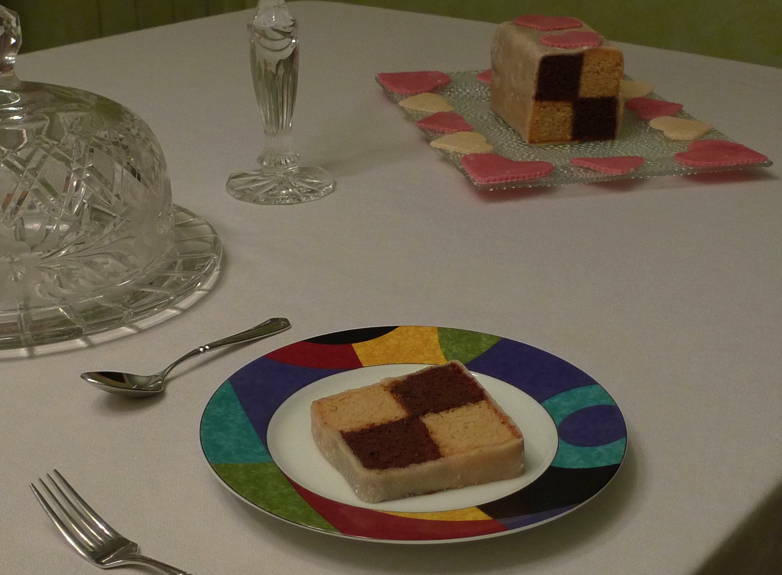 It is a classic British checkerboard-style cake, held together with jam and a marzipan coating. The tale behind the cake is that it was created to celebrate the wedding of Princess Victoria (Queen Victoria’s granddaughter) to Prince Louis of Battenberg in 1884. Given the romantic story about the cake, I think it is the perfect dessert for Valentine’s Day! A little more about the cake’s background and some fun facts can be found at SeriousEats.com. I decided to make a chocolate and vanilla version rather than a traditional pink and yellow version, so I would not require any food coloring. (Or rather, since I am in a British state of mind, I should say “colouring.” 😉 ) I started with a recipe from Jamie Oliver, but I changed it so significantly that the final result was a completely different cake. For my healthier Nooncafe Battenberg, I wanted to use whole grains rather than self rising flour, so I used whole-wheat pastry flour with the addition of baking powder and salt. I also didn’t want to use butter, so I replaced it with coconut oil, and added less oil than the recipe called for. To offset that change, I added more milk for moisture. I also reduced the sugar quite a bit in the batter, since the jam and marzipan also added a lot of sweetness. The final product was denser and heartier than a traditional sponge cake, but it was quite delicious! For decoration, I dyed some of the marzipan pink with beet juice. Just grate a raw beet on a cheese grater, place the grated beet inside of 2 or 3 layers of cheese cloth, and squeeze out the juice. Knead a little of the juice into the marzipan until it is uniformly pink. It’s a little messy, but so pretty! In the book A Year in the Life of Downton Abbey: Seasonal Celebrations, Traditions, and Recipes, it mentions that in the era of Downton Abbey, the food was highly decorated. Even the serving platters would have been decorated. Inspired by that fact, I cut out hearts with my pink marzipan and placed them all around my cake platter, as well as on top of the cake. Preheat oven to 180C/350F. Grease 2 small loaf pans, line the bottom with parchment paper, and grease the parchment as well. This will ensure the cakes come out of the pans in one piece. In a bowl, whisk the flour, baking powder and salt until very well combined. Set aside. Divide the coconut oil and sugar evenly between 2 bowls, and whisk until well incorporated. Beat 3 eggs into each bowl. Stir the vanilla and half the milk into one bowl, then fold in 175g of the flour mixture until just combined. In the other bowl, fold in the remaining flour mixture, almonds, cocoa and remaining milk. Mix until just combined. Take care not to over mix the flour. Spoon the two batters into the greased pans. Bake both together for about 40–50 minutes, or until a wooden skewer comes out clean. The chocolate cake may take longer to cook than the vanilla, so check often towards the end of the baking time. Cool for 10 minutes, and then turn the cakes out onto a rack. To assemble, warm and strain the jam. Level off the tops and sides of the cakes with a serrated knife so each cake is a rectangle and the same size. Cut in half lengthwise so you have 2 long strips of each. Place 1 of the vanilla cakes on a board and brush the top and sides generously with jam, then do the same with a strip of chocolate cake and stick the 2 together, side by side. Gently place the remaining cakes on top, opposite colors on each, brushing all the edges with jam. Trim the cake so the sides are straight, if necessary. Roll out the marzipan on a board sprinkled with confectioner’s sugar so it is large enough to completely cover the cake (with a little extra to use for decoration.) Place the cake on one of the shorter sides, and bring the marzipan up and over the top to cover 4 sides. Pat to make sure the marzipan adheres to the jam on all 4 sides. Trim to neaten the two exposed checkerboard edges with a serrated knife. I find that videos are easier to follow than words when I have a technical recipe such as this one, so here is a link to a video I found helpful when assembling my Battenberg.